You can’t know too much about Anti Icky Poo! A Q&A. Here is an interesting Q & A between Cat Faeries and a customer which we think you’d like to read. We’ve edited it a bit here and there. Question: For clean up, I have used vinegar with water spray. A “natural” spray cleaner from a conglomerate chain store. I’ve also used ammonia in a spray bottle. What you accidently did was spread the smell of ammonia around your home! But don’t feel bad or beat yourself up, today is a new day, we begin anew! We will conquer this problem together! Vinegar does nothing other than in the short run it’s nice to clean up a fresh puddle. But it will not eradicate the smell or the urine proteins and gases, or that ammonia. That’s why it’s imperative to use a product like Anti Icky Poo which does not mask the odor, but actually eats urine’s proteins and gases, thus eradicating it completely. Q: The peeing and spraying is happening in living room, kitchen, dining area, pantry, and porch. A few spots in each room- example, the fire hearth, in front of refrigerator door, by dog treat bin in pantry, on treadmill. Since I’ve got cat urine all over my home, and I’ve probably put the smell of ammonia throughout my house too, what can I do? A: Do you recall how in your Feliway handout we talk about using it in each room “here and there”? You are going to do something similar with Anti Icky Poo – PLUS – use it on the spots that you know have been hit. These are methods that we created based on our many years of experience. The reason for Here and There with Anti Icky Poo is that when we suspect that there is urine in places you don’t know about we want to cover our bases. They can spray little drops or a fine mist on multiple things to claim the entire house or garden as IT”S MINE! Therefore it could be worse than your nose tells you. 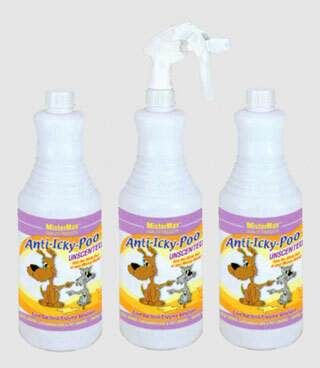 Go through your home with your bottle of Anti Icky Poo with the sprayer intact. Approach a variety of surfaces and objects and give a fine baby misting of Anti Icky Poo “here and there.” Do this for a few days. After a few days this should de-stink and allow you to reclaim your home! Q: They both used the litter boxes until old cat passed, and now young female won’t always let other old male on the porch to use litter boxes. A: When an older cat dies it’s always best to get new litter boxes. There could be lingering smells. A good example is the awful smell of impending death when an old cat is ready to pass. This can freak out any remaining animals “I could be next!” And this can be the trigger for spraying or not urinating in a litter box. A point we always like to make about why we don’t like having multiple litter boxes throughout a house, particularly a smaller house. When boxes are scattered throughout a house the smell of ammonia is in every room that a box is in. This tells the cat it’s ok to deposit urine in multiple rooms, and the sight of litter boxes everywhere and the odor cannot be pleasant for you! Cats don’t avoid their litter box because they are too lazy to walk over to where the boxes are. Q: The flooring of our home is completely tiled and they have urinated on it. A: You are very lucky to have such wonderful floors! My dad was a tile setter so I grew up with tile floors. Urine can penetrate the grout especially if it’s modern grout as opposed to 1960’s grout which was indestructible. Probably a few days of treating the tile with Anti Icky Poo will eradicate any urine which may have penetrated the tiles or grout. Q: I was confusing the flower essences for essential oils – sorry! How many drops per gallon of water? We change the water twice a day, but we need to use big water bowl because big dog drinks a lot. A: Most people have smaller water bowls and we suggest 3 to 5 drops. For your big bowl start with 5 drops for the gallon. You may need a few more drops. In addition to adding drops to the water bowl rub some on her head, ears, back when you have the time.